Beyond Myself - It's not about us, but what God can do through us. 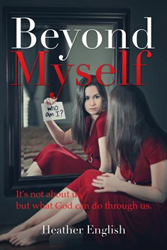 Heather English’s new book, Beyond Myself - It's Not About Us, But What God Can Do Through Us., ($18.99, paperback, 9781498457477; $9.99, e-book, 9781498457484) is an inspiring true story of hope and finding forgiveness in the midst of life’s painful events. It’s the journey of a young lady who has been through many difficult trials, but God turned those crushing moments into beautiful testimonies. God showed her the way out of the personal prison she had put herself in and called her to help others out of their own. Through all the times of abuse, tragedy, and loss, God brought peace, comfort, joy, healing, and ultimately forgiveness to her heart and life. This book is a welcome reminder that God has His plan and His hand on each person throughout every part of life. Heather English tells this enlightening story so that everyone can understand that no matter who you are, what you’ve done, or what you’ve been through, God can use the story of your life to impact someone else’s life. She wants readers to know that some things are beyond their control and ability to fix – so one must trust God to turn the story around for His glory. This book is her genuine way to reach out to others to help. Xulon Press, a division of Salem Media Group, is the world’s largest Christian self-publisher, with more than 15,000 titles published to date. Retailers may order Beyond Myself - It's Not About Us, But What God Can Do Through Us. through Ingram Book Company and/or Spring Arbor Book Distributors. The book is available online through xulonpress.com/bookstore, amazon.com, and barnesandnoble.com.